We were approached by Reception Academy to re-write their existing system and improve on it; including adding in extra functionality, not only to improve online bookings, but also to make it easier for Reception Academy to manage the various aspects of running their hospitality training courses on a day-to-day basis. As Reception Academy already had a website and backend admin system, which ranked highly on search engines, it was clear that we needed to plan the upgrade effectively in order to keep this ranking and the wide user base Reception Academy had. A collaborative approach was taken in order to see how the user's journey through the website could be made better. The key functionality and skeleton layout of the new website was clearly defined during the wireframing process undertaken with Reception Academy. Reception Academy were always involved in every stage of the wireframing process, meaning they could feedback back to us early, which allowed us to build a system that matched their requirements on time and to budget. 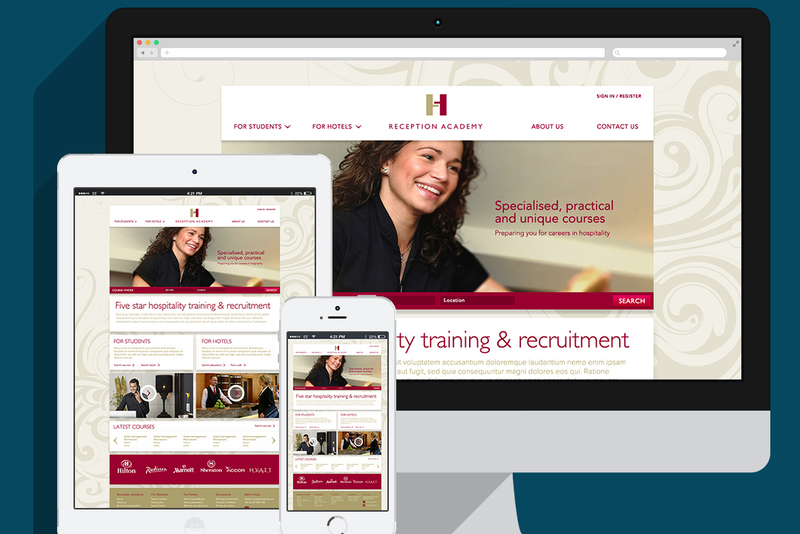 We needed to design & build a website that provided all the functionality on their existing website, appealing to the diverse range of people it was aimed at; including students looking for courses, graduates looking for jobs and hotels seeking to employ graduates from Reception Academy's courses. Having done many custom builds like this in the past, our expert team of web developers knew exactly what to use to build Reception Academy a web application packed full of features, appealing to the broad demographics the site would be aimed at & whilst allowing Reception Academy to streamline their administration processes. We designed & built a bespoke CMS for Reception Academy, using the Symfony framework, which enables them to manage their courses, bookings, job postings, graduation ceremonies, ecommerce shop, course bookings, online orders and much more. Reception Academy already had a website and backend admin system and they wanted to retain this information. We successfully migrated the data from their old system into the new website we built for them. The website displays courses that can be booked online. Reception Academy can manage all aspects of their courses via their admin area including: dates & classes, discussion board, online courses, venues & testimonials. When a course has been purchased it becomes a booking. Reception Academy can manage their bookings in their admin area. Once a student has completed a course they can request a certificate of completion & if a course is full students can request to be put on a waiting list, these can also be managed in their admin area. We built a recruitment section that allows hotels to post jobs and students can apply for them on Reception Academy&apos;s website. Reception Academy can manage the recruitment process, job listings, job applications & their recruitment packages in their admin area. We built a custom ecommerce shop which allows Reception Academy to sell gift vouchers, recruitment packages and recruitment services online. They can manage their products, purchases, promotions, invoices, credit notes & shipping costs in their admin area. We have been a Sage Pay partner for 9 years. We recommended Reception Academy use them for their purchases & bookings and we integrated Sage Pay into their website as their payment option. Once a student has successfully passed their course, they are invited to a graduation ceremony where they are presented with their graduation certificate. Reception Academy can manage these graduation ceremonies in their admin area, & invite students to attend. We developed a system that gives Reception Academy the ability to show certain products & courses to students depending on their location. This gives Reception Academy the ability to tailor their courses more effectively to their students by only showing them the courses that are relevant to them. We added a blog to Reception Academy&apos;s website and they are able to manage their blog, add/remove blog posts, in their admin area. We added live chat to Reception Academy&apos;s website so their students could easily contact if they had questions about their products & courses. As Mailchimp experts we recommend Reception Academy used them for their newsletter marketing software. We connected their website to their Mailchimp account and pass across student, booking & order information. We designed and built custom reports to help support Reception Academy with their day to day business & marketing decisions. In the admin area they can view detailed reports on students, courses, bookings, orders etc. We host Reception Academy&apos;s website on a dedicated cloud server. We manage and maintain the website & server applying updates and security patches when they become available. We also undertake routine server maintenance to ensure the server and website are at optimal performance. We monitor Reception Academy&apos;s website 24/7 365 days of the year. We are altered if any issues arise and we can then investigate and fix them. We have a 99.9% uptime rate & we regularly achieve page load times of less than 2 seconds. We backup Reception Academy&apos;s website daily, which includes onsite and offsite backups. We haven&apos;t had to restore from their backup&apos;s but it&apos;s good practice to have them just in case we need to. We installed an SSL certificate on Reception Academy&apos;s to make sure their customers data is encrypted and secure when they enter their personal information into the website. We manage the purchase, installation and renewal of their SSL certificate. We created Reception Academy&apos;s Google Analytics account and added their analytics code to their website. We setup ecommerce tracking and added their goals to their Google Analytics account. We also added their Adwords & Facebook remarketing code to their website. We setup Reception Academy&apos;s Google Webmaster Tools account & we manage their 404's, structured data & sitemap submission. We provide ongoing support, advice, wed design & web development to Reception Academy. We have become their first point of contact for all things web related. I was very excited about going live with our new website, and must say that Sam and the rest of the Wired team are a pleasure to work with. What they have done is wonderful and the functionality they've added is fantastic, making our life so much easier.